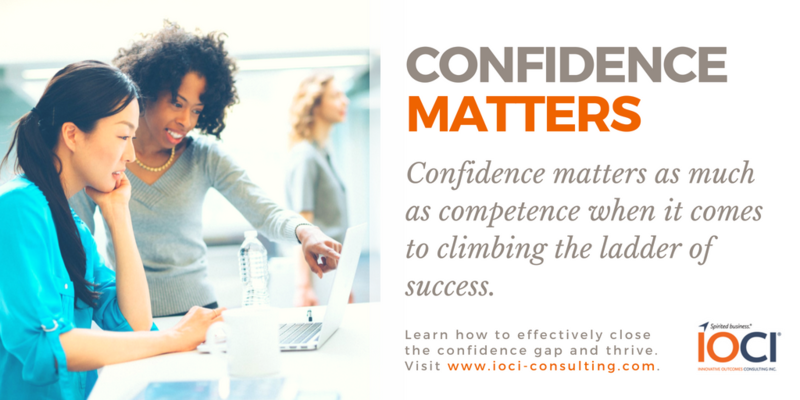 Women: Don’t let the ‘confidence gap’ derail your career - Innovative Outcomes Consulting, Inc.
What is the confidence gap? The numbers point to a popular conclusion: Roughly 6 percent of CEOs at Fortune 500 companies are women, only 21 percent hold a senior vice president title and just 29 percent introduce themselves as vice presidents. And yet women now outpace men in earning college and graduate degrees. Half the U.S. workforce are women. So clearly the solution is to raise awareness of women’s achievements and consciously look to promote women when possible (aka quotas). Except corporate America has tried that and it hasn’t moved the needle. Perhaps that’s why the Global Leadership Forecast 2018, published by Development Dimensions International, The Conference Board and EY (Ernst & Young Global Limited) took up the subject. According to the report, getting more women in leadership had very little to do with singling out women. The keys to success on that score involve fair talent review processes, relying on data for hiring and promotion decisions, formal mentoring programs and ongoing performance decisions. But the answer isn’t as simple as listening to a pep talk on your Bluetooth headset on the way to work tomorrow morning. If it were about feeling good about yourself, women would be running household names. It’s also not the same as leaning in, because it’s possible to participate, to seek challenges, but still sabotage your contribution. According to the women who wrote the book on the confidence gap, literally, psychology professor Richard Petty at Ohio State University nails the definition of confidence: that trait that turns thoughts into judgments about what you are capable of and then transforms those judgments into action. Yet what sounds straightforward when typed out doesn’t roll that way in reality. In a nutshell, women feel confident only when they are perfect; men don’t let those natural human doubts stop them from plowing forward. As a result, journalists Katty Kay and Claire Shipman, authors of The Confidence Code: The Science and Art of Self-Assurance – What Women Should Know, talked with women investment bankers who said they didn’t really deserve the recent promotion, and female engineers who confess they’re not sure they’re the best choice to run a high-profile project. Mind you, these aren’t polite niceties. These are self-assessments. Research studies bear this out. Time after time, men overestimate their abilities and performance while women underestimate theirs, even though the actual results are equal. So it’s no wonder men initiate salary negotiations four times more often than their counterparts. Or that women ask for an average of 30 percent less pay when they do go to the bargaining table. Men apply for job openings when they meet half of the qualifications. Women hang on to their applications until they match every skill for the position. Time after time, men overestimate their abilities and performance while women underestimate theirs, even though the actual results are equal. Indeed, studies by Goldman Sachs and Columbia University reveal that companies with a high percentage of female employees outperform their competition on every bottom line of the profitability charts. Men certainly aren’t blind to this confidence gap, but they say bringing it up, offering advice, walks a fine line of sounding offensive, or worst, sexist. So they continue to be themselves: impulsive, which spurs them to volunteer, take risks, be wrong and shrug off rejection. But perhaps the most important lesson lies in their likeability while they practice these traits. According to a University of California at Berkeley study of overconfidence, psychologist Cameron Anderson asked 242 business students to check off a list of famous names and events they knew. He deliberately threw in some fakes, and filed the exercise away. At the end of the semester, he asked these same students to rate each other, to determine who they considered the top dogs among their peers. Yep – the students with the highest social status had also picked the most fake names on that earlier exercise. Anderson’s conclusion: Confidence matters as much as competence when it comes to climbing the ladder of success. But perhaps the best takeaway? True confidence, as opposed to bluster, is not demeaning or off-putting. And it is noticed on a daily basis, which makes it a worthy trait to pursue.